Great white sharks are powerful, warm-blooded fish that have existed in our oceans for millions of years. Despite their fearsome reputation, the great white shark population is suffering greatly at the hands of man. 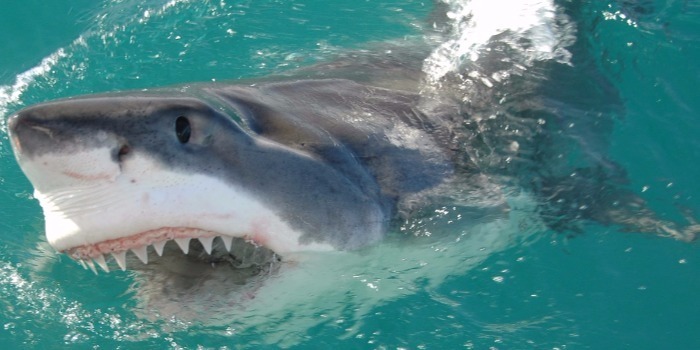 How much do you really know about great white sharks? Sharks don’t have eyelids. When a great white attacks its prey, its eyes roll backwards as a protection mechanism from flailing teeth or sharp fins. This means for the last second, the shark is not actually able to see its prey at all. The biggest great white ever recorded was caught off the coast of Cuba in 1945. This specimen was over six metres long and weighed 3,324kg. Two other, slightly smaller six metre sharks have also been reliably recorded in Western Australia and Prince Edward Island. Great white shark mothers give birth to litters of two to six young, after a gestation period of around 18 months. When born, the young measure four to five feet in length. Great whites give no care for their offspring after birth and new-born pups often stay in the safety of the area in which they were born to avoid cannibalism. Female great white sharks are approximately one metre longer than male great white sharks. Female adults reach an average length of 16 feet, while male adults reach about 12 feet. It is thought that they are bigger as more girth is needed to carry their young. Great white sharks have astounding healing abilities. Not only do they rapidly heal from minor wounds, but also very deep ones that would be fatal for other species. 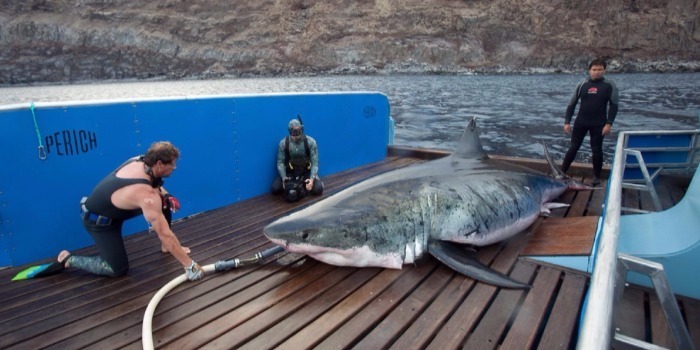 Take a look at the case of ‘Prop’ – a Gansbaai shark that was cut almost down to the spine by a boat propeller. In 9 months, this shark’s wounds were entirely healed, as documented in the video below. The coast of South Africa is one of the best places in the world to see great white sharks. The area around Shark Alley and Dyer Island is ideal for shark cage diving and offers spectacular sightings of shark breaching and seal predation. Enquiries about shark cage diving tours with Shark Zone can be made on our online bookings page here.